The Florida Board of Funeral, Cemetery, and Consumer Services requires each funeral director, embalmer, and combination funeral director and embalmer to complete 12 hours of continuing education every 2 years. The deadline is every odd year on 8/31. At least one hour of continuing education shall be in the communicable disease category. 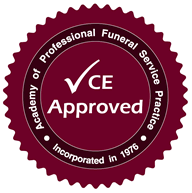 Funeral Service Academy has been assigned approved provider #23408. After you purchase the course online, you will be taken to a receipt page which has a link to take the final exam. The link will also be emailed to you. The final exam questions are located at the bottom of certain pages throughout the Course PDF. You can download the course by clicking on the “View Course PDF” in the course link above.